Be the first to share your favorite memory, photo or story of Mabel. This memorial page is dedicated for family, friends and future generations to celebrate the life of their loved one. 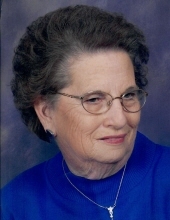 Funeral services for Mabel Peacock, age 88, of Centerville, will be held 11 A.M., Friday, January 25, 2019 at Walters Funeral Home in Centerville, Texas. Bro. Louis Mize will officiate the service. Following the service, Mrs. Peacock will be laid to rest in the Centerville Cemetery. The Peacock family will receive friends Thursday, January 24th from 6 P.M. to 8 P.M. at the funeral home. Mabel Louella Peacock was born September 28, 1930 in Centerville, Texas. She was one of eight children born to Henry Reed & Roberta (Bentley) Lagrone. Mabel married the love of her life, James Peacock, July 3, 1958. They made their home in Houston where James worked for the Houston Police Department. The couple moved back to Centerville in 1981 where Mabel remained until her passing. Mabel loved her family and was a devoted wife and homemaker. She especially adored her children and grandchildren and enjoyed cooking for them and spending time with them. Mabel loved playing board games with her sisters, as well as, sitting on her front porch. Moments spent visiting folks who stopped by and talking about “old times” was another thing that Mabel cherished. Perhaps, most of all, Mabel enjoyed shopping. It was her favorite past time. Mabel passed away January 21, 2019 in Madisonville, Texas. She was preceded in death by both of her parents; husband, James Peacock; brothers, Pete, Robert and Edward Lagrone and great grandson, Coyt Jones. Surviving family members include son, David Peacock (Jamie) of Centerville; daughter, Lisa Lee of Centerville; brother, Harold Ray Lagrone of Arlington and sisters, Bessie Vajdak (Ed), Maudie Ellis (Ray) and Margie Yeates (Don) all of Centerville. Mabel is also survived by grandchildren, Courtney Peacock, Jessica Townsend, Tiffany Williamson (Charlie), Tara Conway (Justin Jones), David Peacock, Jr., Lauren Rayborn (Austin), Jared Martin and Micah Sullivan and great grandchildren, Tyler, Grace, Abby, Britt, Josie, Hank, Emmy, Hayden, Josh & Colt, as well as, numerous nieces and nephews. Arrangements are under the direction of Walters Funeral Home in Centerville, Texas. To send flowers or a remembrance gift to the family of Mabel Louella Peacock, please visit our Tribute Store. "Email Address" would like to share the life celebration of Mabel Louella Peacock. Click on the "link" to go to share a favorite memory or leave a condolence message for the family.